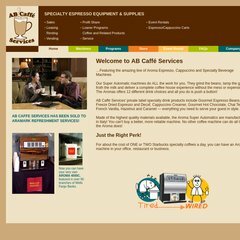 Topics: Ab Caffe Services, and Machines. Its 2 nameservers are ns2.hostmonster.com, and ns1.hostmonster.com. Its local IP address is 74.220.207.156. It is hosted by American Registry For Internet Numbers (Virginia, Chantilly,) using Apache web server.